The stadium tour began in Arizona on Tuesday night. 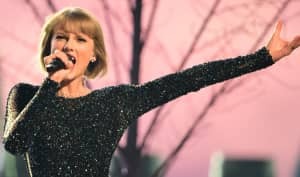 Taylor Swift's Reputation stadium tour kicked off in Glendale, Arizona last night. The live show culminated with support acts Charli XCX and Camila Cabello joining Swift on stage but there were other surprises earlier in the show. One, for example, was the appearance of Tiffany Haddish. The Girls Trip star delivered a pre-recorded "Taylor can't come to the phone" line in Swift's "Look What You Made Me Do." The pair have a little history. Swift was the musical guest on the night that Haddish hosted Saturday Night Live in November 2017. Check out the clip from Glendale above.